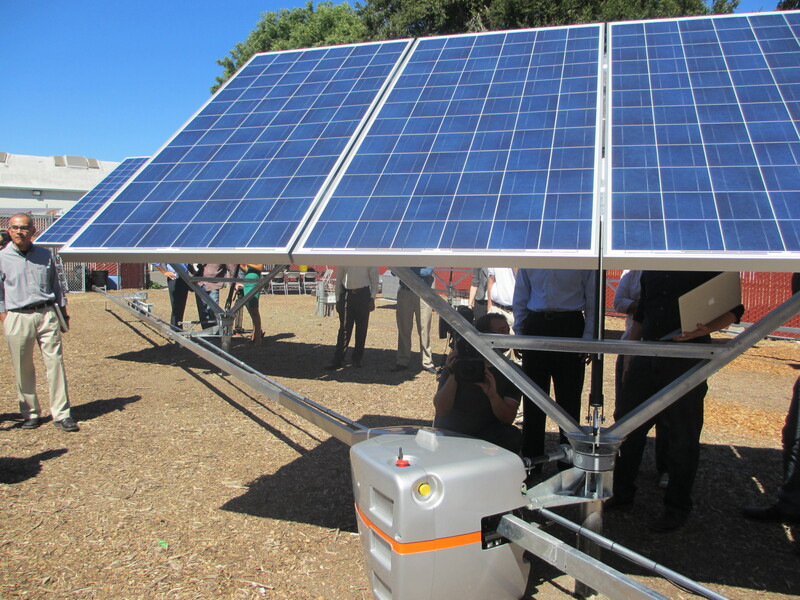 Like every other industry on the planet, the solar sector is increasingly turning to robotics. On Wednesday a startup called QBotix — which uses robots to tilt solar panels to face the sun as it moves across the sky — announced that it’s raised $12 million in funding in a round led by huge global energy companies E.ON and Iberdrola. Small rooftop solar systems don’t conventionally continuously tilt panels and the panels are usually positioned on rooftops in the optimal angle to convert the most sunlight possible without moving. But larger systems that are built by utilities and companies on the ground — like Apple’s solar farms — use technology called trackers to tilt the panels to get as much electricity out of them throughout the day as possible. Trackers commonly use motors to tilt the panels, and there’s generally two types of solar trackers, dual-axis trackers — which make finer tilts and are more expensive — and less expensive single-axis trackers. QBotix’s trackers use robots, which run along an elevated track around the solar project, to tweak the angle of the panels. The robot trackers are equipped with sensors, GPS and a wireless connection, which allow them to continuously report back data about the panels to the solar project owner. Using robots for tracking can save 20 percent of the cost of the overall system, says the company. That’s why the large power companies see promise in QBotix, as an economic way to potentially reduce the cost of their solar deployments. Last summer, QBotix launched a second generation of its solar robot tracker system that can not only manage and tilt more panels than the first model, but is also smaller, lighter weight and has fewer pieces, making the robots easier to assemble. QBotix launched its first model back in September 2012, and as of last year the systems had been deployed at more than five commercial scale solar farms in California, Arizona and Japan. QBotix says it plans to use the new funds to build out its team and to expand manufacturing and sales. The company’s current investors also participated in the series B round, including NEA, Draper Nexus and Firelake Capital Management.